On this day, 89 years ago, the New York Times carried a story in its far left hand column with the headline “Long Step To Peace Is Seen By Britain in Germany’s Reply.” Absent a banner headline, it recounted the text of a diplomatic note from Germany to Great Britain about ongoing negotiations to resolve several matters growing out of the Versailles Treaty ending the Great War. 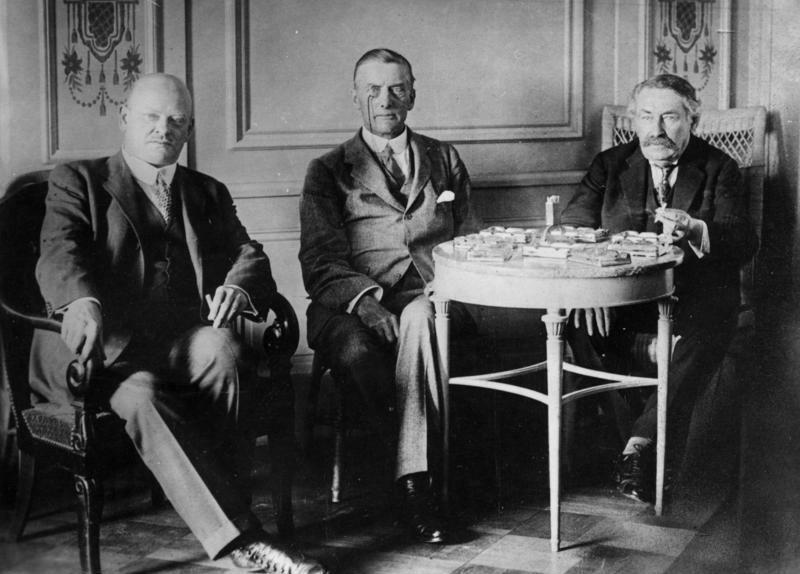 These included border disputes along Germany’s western border, the inviolability of the Versailles Treaty and Germany’s entry into the League of Nations. These negotiations ultimately ended up settled in the Locarno Peace Treaties several months later, and were the basis for the Nobel Peace Prize that Britain’s Foreign Minister, Austen Chamberlain, won. Eleven years later, Germany abrogated both the Versailles and the Locarno Treaties with its invasion of the demilitarized zone along the Rhine. The following year, Austen’s half-brother Neville became Prime Minister of Great Britain, and earnestly sought to resolve tensions in Europe by acceding to Hitler’s demands. These three issues cloud out other crises that just a few weeks earlier had concentrated the minds of those in charge of U.S. foreign policy: the ongoing civil war in Syria, disputed Presidential elections in Afghanistan and a brazen invasion of Iraq by extremists seeking to establish an Islamic state across territory of Iraq and Syria. Events such as these don’t leave room for truly devastating humanitarian crises that never even make it in the news, like the ongoing refugee crisis in South Sudan where 700,000 people are internally displaced and hunger is affecting millions more. If Hillary Clinton gave the title “Hard Choices” to her memoir of her tenure as Secretary of State, John Kerry’s sequel from just last week will make her watch look fairly tame. Each of these three major events – Ukraine, border children, Gaza ground invasion – would carry banner headlines on their own. Any newspaper’s difficult decision last week was which deserved prominence. They also each have historical precedents that are cited and considered. Match the precedent with the crisis: Iraq’s invasion of Kuwait in 1990; Kosovo’s secession from Serbia in 2008; the Mariel boat lift in 1980 or the Haitian migrant crisis in 1994; the Israeli invasion of Lebanon in 2006 or of Gaza in 2012 or 2009; the downing of a Korean airliner in 1983, or an Iranian passenger jet in 1988. None show the way to a clear cut path to resolving the crisis at hand. History can give a pretty clear map to what transpired, identifying the sequence of events and the conditions that lend a certain air of inevitability to any outcome. History is not as good as showing a way forward, especially when the choices in each of these cases are more than hard – they are messy and unpredictable in the outcomes they yield and the consequences they unknowingly generate. So, what is the connection between a fairly mundane story 89 years ago and these major events? That ordinariness of those diplomatic negotiations between Germany and Great Britain resurfaced 11 years later. And they re-surfaced in a way that dominated world events for at least the subsequent 11 years as well. Which of the three major stories of this week has the potential for such long-term consequences? Much of the answer lies in the nature of the resolution. Perhaps, the resolutions would be temporary fixes, only to re-surface in a short period, but enough to remove the crisis from the front pages. Or, perhaps the resolutions are of the muddle-through variety, allowing governments to contain the potential for escalation. Or perhaps, resolution is left untouched, as the crisis benefits specific, narrow self-interests of the parties involved? Rare indeed is the resolution that actually resolves a crisis. Opposite the German diplomatic note story, on the far right hand side of the paper, 89 years ago, ran a larger headline: “Scopes Guilty, Fined $100.” Well, that certainly resolved the debate over evolution. This entry was posted on July 22, 2014, 5:02 pm and is filed under History ahead, International, Public Affairs. You can follow any responses to this entry through RSS 2.0. You can leave a response, or trackback from your own site.